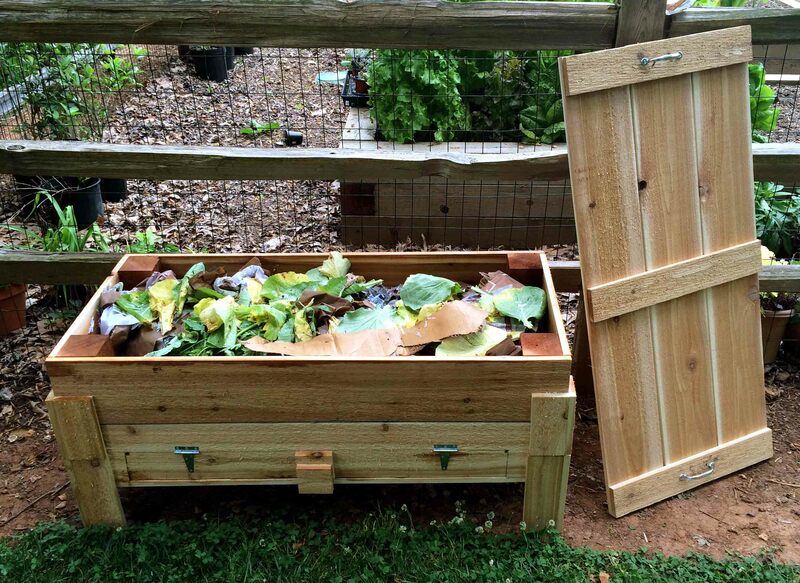 Our vermicompost bin which we show you how to make in episode 622 (air date of 11/28/15) is easy to build and works great. It can be modified any number of ways to suit your needs or your materials. There’s also a link at the bottom of this post where you can download these instructions as a pdf. We used untreated new cedar from the lumber yard, but you could easily use scrap wood you already have, leftover exterior siding, or pallet wood. We suggest you avoid the use of pressure treated lumber, as the waterproofing chemicals in the wood may leach into your compost. Measure, mark, and cut all of the lumber using the dimensions above. Build three four-sided bins. Each bin is comprised of (2) 48-inch sidewalls and (2) 20.25-inch sidewalls. The ends of the long 48-inch sidewalls should be exposed and “sandwich” the ends of the shorter sidewalls. Use 4×4 blocking standing on end at each inside corner to give yourself something to nail into. Make sure all three boxes are the exact same size by test-stacking them on top of one another. Add a floor to one box by nailing (3) 48-inch boards to the underside of the bin frame. Along the outer edge of one long side, do not fasten the floor to the sidewall in between the 4×4 blocking pieces (leave this edge area nail-free). This will allow you to create an access panel for drip pans. Mark your panel’s desired outline on the sidewall at a length and height that allows your drip pans to be inserted and removed easily. Use a jigsaw to cut away this panel. Now re-attach the panel to the sidewall with hinges. You may need to sand or trim the panel to allow it to open and close freely. If your drip pans allow, you may choose to add some extra cross-pieces on the inside to help hold the floorboards together. This is now the bottom box of the worm bin. Attach legs to the bottom bin using (8) 11-inch boards. Pair two boards at the outside of each bin corner for each leg. Position each leg so that there is a roughly 4-inch gap between the top of the bin and the top of the leg. This will allow the upper bins to be stacked on top with no space in between the bins. Attach legs to the upper bins in the same way using (16) 7-inch boards. Leave the same 4-inch spacing between the top of the bin and the top of the leg. The exact size of this gap is not terribly important; they key is that the legs of one bin must slip over the top of another bin and that the bins stack tightly without interference from the legs. Adjust your legs accordingly by repositioning them as you fasten or by trimming them shorter. It may help to attach the legs with the bins stacked on top of one another to ensure this spacing works. Piece together (3) 48-inch boards to create the lid. Fasten them together by nailing down through (3) 21.75-inch cross-pieces at the ends and in the center. (Make sure your nails don’t go all the way through both boards!) Fasten (2) 12-inch pieces on the underside as interior cross-pieces, but be sure that these cross-pieces will clear the sidewalls and 4×4 blocking in the corners. If positioned properly, these inner cross-pieces become “stops” for the lid that lock it in place and keep it from sliding around when the bin is closed. Add handles to the lid if and where desired. Position hardware cloth along the bottom sides of the upper bins. Trim the mesh if needed. Fasten it to the bin frame and 4×4 blocking with screws through the grid squares and fender washers larger than the squares. The two upper bins should look identical and be interchangeable with one another. Once your bin is finished, load the lower box with food scraps from the kitchen and garden, even shredded paper products. Keep adding new scraps as the worms consume what’s there. 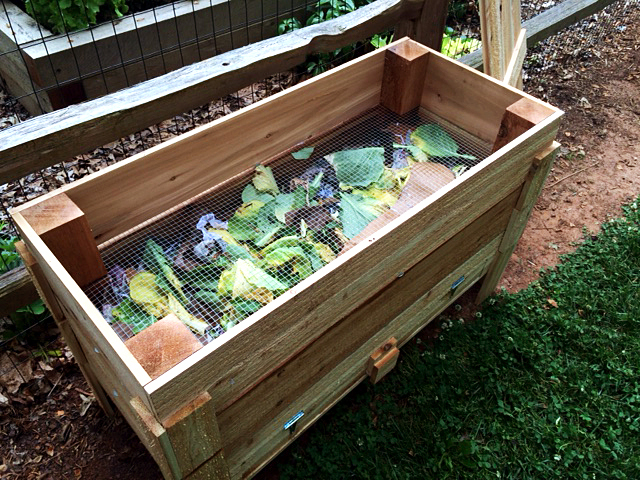 Eventually you’ll add the top box with new food scraps to draw the worms up through the wire mesh. Then harvest the castings and exchange the top box to the lower position and repeat the cycle. The final step in the process is cutting an opening in the bottom front to make a small hinged door. This is used to access and store the pans or containers that capture the liquid worm leachate. 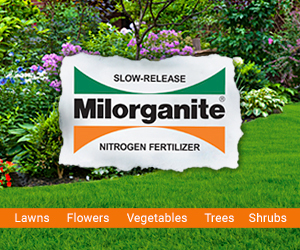 This is black gold and the best organic liquid fertilizer you can get. You won’t want to waste a drop! 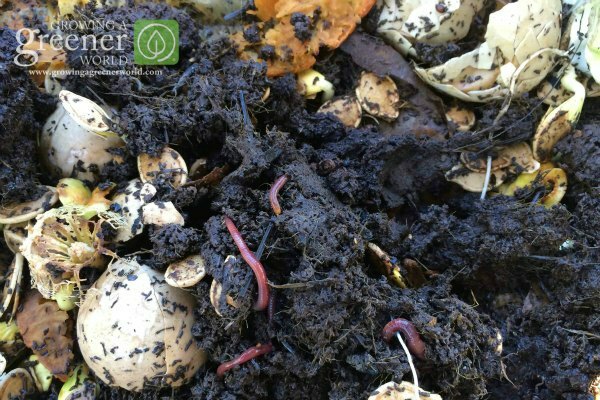 Within a few months, your worms will consume all the inputs you provide to produce the ultimate compost that is packed with nutrients. Compared to ordinary garden soil, vermicompost as it’s know is 5 times higher in nitrogen, 7 times higher in phosphorus and has 10 times more nitrogen. Plus disease-fighting properties and other benefits we’re still learning more about. What you see below is the handiwork of the red wigglers I added to this worm bin about 4 months before this picture was taken. The ultimate goal of the decomposition process cortousy of our worms is vermicompost. That is what you see surrounding the worms in this picture. 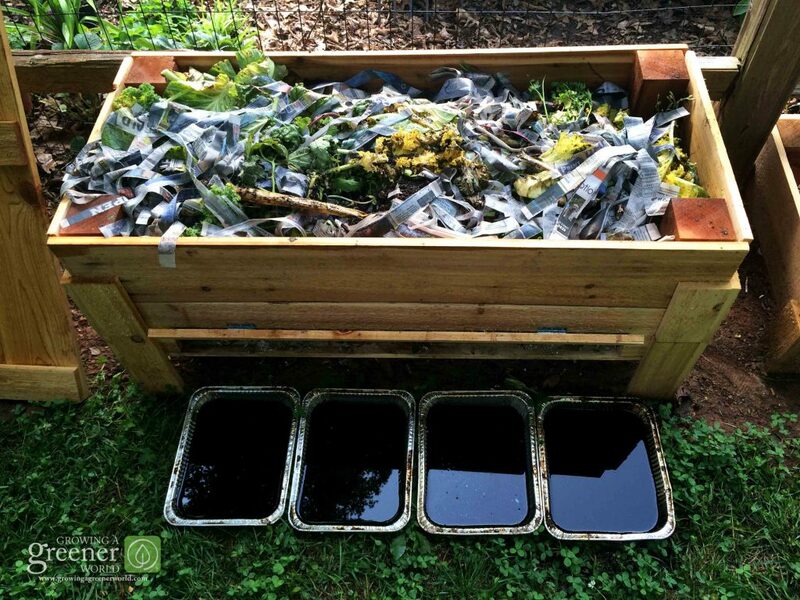 Originally it was nothing more than food scraps and the paper products as shown above. Feeling industrious? Make your own worm bin, exactly like the one we made for the show and that I use to make my vermicompost. You can download these instructions as a pdf here. Is there any safe way to seal this box? I just put in alot of time to create this beautiful box and would hate for the elements to destroy it. But I will also want to keep the worms safe. Any ideas would be appreciated, Thanks! I don’t treat my box but use weather-resistant cedar. If you want to treat, consider a water-based sealant. But you would have to ask the people that sell that what would be best since I have not taken this step. 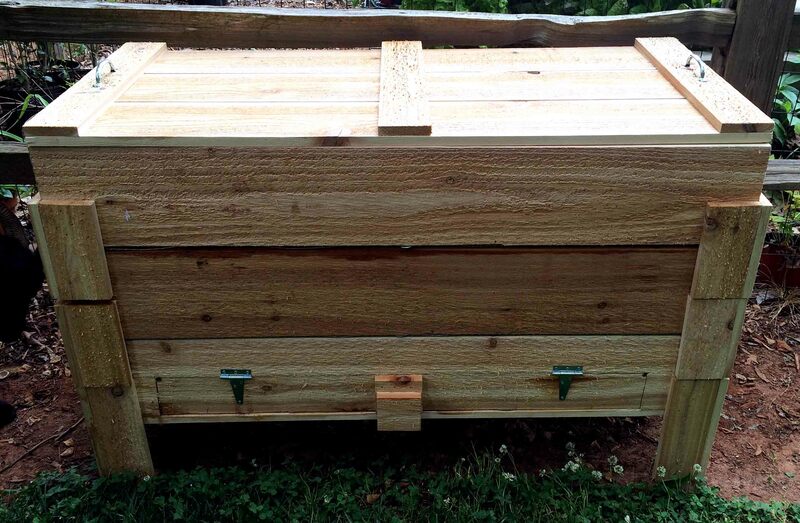 Joe , I was wondering if i can use an old cedar chest for a worm bin and modify it similar to the one you have made on the show? Will the cedar effect the worms at all? BTW Love to watch your show! Hi Mary, I’m sure the cedar chest should be just fine and your worms will be very happy. Thanks for the kind words about the show. I’m retired, don’t cook much, don’t have much food scraps, and no garden. But I have lots of grass and leaf cuttings that I would like to recycle as efficiently and non labor-intensively as possible. Does anybody have any advice for em? 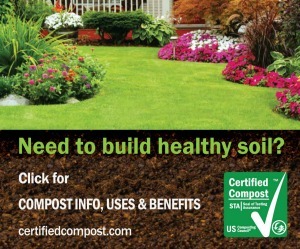 Believe it or not, many people seek out leaves and grass clippings for their compost piles. The information you have given is very valuable, for example how many worms to start with the worm bed. I think it would be useful to add molasses to make the resulting liquid worm resistant. Rain 100% of the liquid. I added shredded paper and sheddd leaves plus aged horse manure. I too the worm dealers Advice and added 5,000 red wiggers. I flex sealed the other two boxes sides as wee as the underpart of the top. With two crakes running down the four foot dimension on the top will I get too much rain entering the top box. For those who have built the bin per the dimensions outlined on the show, how many worms did you use when starting your bin? I started with 1000 worms 3-4 months ago and have yet to fill the first tray with castings. The worms are definitely producing but at a much slower rate than I expected. The worms appear healthy and there are no odd smells. I freeze/thaw peelings before adding them to the bin. What size mesh is the hardware cloth? Larry, 4×4 hardwood cloth with 4 squares per inch should work well. I would site your worm bin out of direct sunlight. Under a tree or overhang is a good spot. Make sure it is convenient you you, so that you will use it. Happy worm composting. Can you list the totals of the different lumber sizes that I can request from the lumber yard? 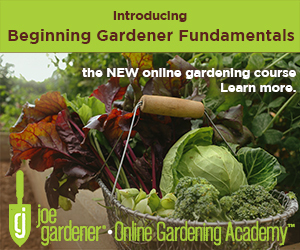 Joe, I’ve been enjoying the show (and now the resources on your site). This project looks really good as I’ve been hybrid-composting since last July (small closed container, turning every week, for first several weeks until odor subsides then open but covered container. During the latter phase I had some volunteer worms climb up into the containers and they’ve been multiplying since. Thanks again for the show, site & resources. Hey Greg. Odor is a common concern when composting or vermicomposting. It usually comes down to your feedstock being too wet, and/or not enough carbon material such as shredded paper, dried leaves, cardboard, etc. It’s the wet nitrogen that produces the most offensive smells typically. Mixing that with the browns / carbon material (or in the case of a worm bin, laying it across the top) would help a lot. As for the liquid, if you find that to be producing an objectionable odor, I would just do what you need to transfer that to a sealable contanier, perhaps a bucket with a tight-fitting lid, and then using it in a diluted form in the garden as soon as you’re able. But as long as it’s covered, you should be fine. Hope that helps! Joe, it helps tremendously, thank you. I watched the segment again and wondered how bad could the smell be if some keep bins in the house/under the sink? But you clarified what it is that gets out of balance to create the smells and what steps to take to remedy it. And that really helps a lot as I’m still working to gain the knowledge and experience in how/why it all works. Joe, I am about to set up the compost bin, how long dies it take to get some worm juice? Not long Carrie. Once you have your worms and the food scraps in the bin, keep it moist and check in a few days. That should give you enough to dilute 10 or 20 to 1. And keep checking every few days. As you add moisture, it will even speed up the process. But don’t add moisture for that reason alone. Mainly you just want to give them a moist environment. The “worm juice” is their gift to you for doing so. Good morning Joe! This was a great show and an excellent idea. I’m going to use old cedar fencing for our worm bin. Can you give the size of mesh you guys used? I’m looking at the pictures here and it sure appears to be finer than, say, chicken wire. Hey Rick. It is 1/2 inch mesh. Easy to work with and perfect size for worms to move through without anything falling through. Glad you liked the show and idea. Good luck. In reviewing the dimensions to your system, my wife pointed out to me that the critical element might be the size of those collecting pans. She has informed me that the biggest ones easily available are those that will fit into a standard oven. Something I had not considered when looking at how I was going to construct this. ‘Listen to the wife’ again is proven to be a valuable philosophy. I would say you didn’t have enough food stock in the bin to keep them up in the midst of it. While they don’t like to be at the top of the heap, they will keep working their way in that direction to get to new food. So that should prevent them from falling out. I can only reflect on my experience with the same exact bin and I’ve never had this problem David. I try to always keep several inches of new feedstock at the top and that seems to work well. I’m sorry you had this problem. But next spring (or now if you live where it doesn’t freeze, add a lot more shredded paper and newspaper, food scraps, grass clippings, coffee grounds, etc. to build up the bedding. If they’re happy and have enough food, they should def. stay there. This is most interesting and helpful! Question. I live in Oklahoma where it gets to be hot in the summer. I’m not sure shade is going to be cool enough for the worm bins. Winter is not a problem as we have fairly mild weather for the majority of days. In hot climates, what can I do to keep the worms cool enough? Make sure they do have shade but then monitor the bin frequently to make sure it stays moist. That is the best thing you can do given your circumstances Neil. Just found your site looking for ideas to make a worm bin from pallets. I like the stacking thing as it would help with not needing to sift worms from the compost plus possible splits later. One concern though is the screening. Worms will mostly stay where their bedding and food source is. I occasionally find a worm or two that’s fallen through but generally that rarely happens. Worms dive deeper when exposed to light (but only deep enough to get out of the light. But in a covered environment, they’re just below the soil surface and not so far down that they risk falling through. I just finished building one from the plans provided. Great weekend project! I dug up about 50 worms from our yard to put in. My wife is excited to get the juice and casings for the garden. It really looks good in the yard. Thanks! That’s great Chris! So glad you did this. Keep us posted on how it works out for you! awesome article, will be building one in the spring. I would like to say thanks to you and all the crew for so much great advice. I’ve applied a lot of your show advice to my home garden. I love the look of this bin and it’s usefulness. Could you tell me how I should over winter the worms? I live in Virginia so we have wild temperature variations. Hi Tynana. Thank you for your nice comments! You may not be able to keep your worms alive through winter. Virginia temps get too cold for red wigglers. But as I mentioned in the article on “If worms survive winter”, their eggs should survive and if so, you will see tiny baby worms next spring. That will be your new crops to keep the process going. Having said that, I’m “trying” to keep my worms alive anyway. I’m adding lots of shredded paper into the bin, somewhat to serve as an insulating blanket. But I have noticed my worms have def. slowed down on their food consumption. Time will tell. Good luck Tynana. I would like to get episode 622 about the worms. please let me know how to find it. Hi John. 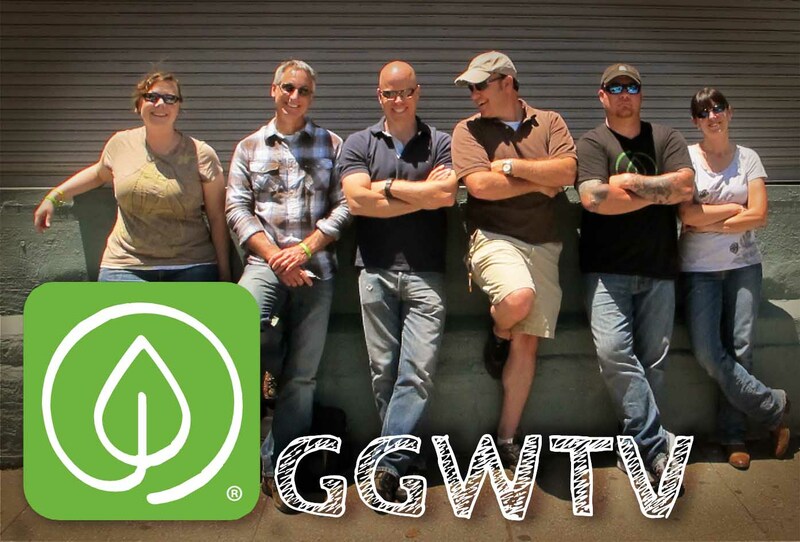 That episode will air on 11/28 and we’ll post it online by 11/31. So don’t worry that you couldn’t find it yet. It’s not available until then. Thanks for sharing this! Printed it out and will set one up soon! Thank you and your staff for another DIY project and giving up the plans as well. Keep up the good work and I can’t wait to see the new season. 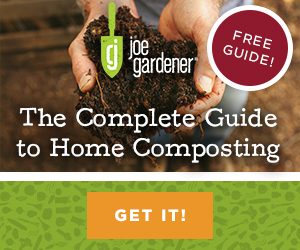 Joe, If you want to give your fans an in depth, free education on worm farming add a link to Red Worm Composting.com. Bentley Christie runs the site and has a wealth of resources. He is on vacation right now in case you want to o.k. the link but you can go see. There’s no Composting.com , but there’s a Composting.ORG. He doesn’t have controll on releasing the videos He just makes them. Thanks for the Ideas! Thanks for this great idea! Is it downloadable? Good point William. I went back to see and it is not set up for that now. I will see about converting this to a downloadable format and let you know when I do. BTW, this episode airs in a few weeks and it will be viewable online so you can see it being built and how it performs in action several weeks later. It is a great system. Thanks for your question. There’s no mention of the worms? How many? Kind? Reliable sources? Hi Lorraine. We (like most vermicomposters) use red wigglers. 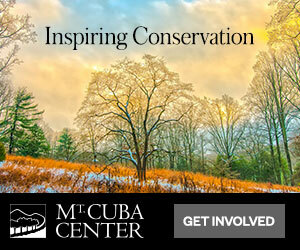 You can order them online or check to see if you can pick them up locally. They are commonly found in bait stores also. I’ve purchased lots of red wigglers from the fishing department at Walmart in fact. One pound is a good amount to start with for the average home system. That will give you approx. 1000 worms. We started with 2000 worms as we have a pretty large system for a home garden. I cannot believe that you are making us wait “3” MONTHS for the video!